IHeart Organizing: Items IHeart Holiday Giveaway Extravaganza: See Jane Work! 698 Items IHeart Holiday Giveaway Extravaganza: See Jane Work! If you have been a loyal reader of IHeart Organizing, you will be familiar with one of my long time sponsors, See Jane Work! These stylish and versatile heavy-weight canvas storage bins from Lovell make containing clutter feel more like decorating. They'll keep everything from product samples to beach towels organized in plain site; no need to relegate these lovely storage bins to the closet. Products from the textile design companies Lovell are the perfect balance of aesthetic form and no-nonsense function. The reinforced handles make them easy to lift and carry, and when they're not in use they fold flat, so you won't have to find someplace to store your storage. They even include plastic boning that helps keep their shape. These beautifully durable bins are perfect for the office, laundry room, entry-way and even children's rooms. And See Jane Work is giving two away!! I use storage bins for EVERYTHING! My favorite has to be to keep toys contained, though. I love these bins! I would use them as a clothes hamper in the nursery, with handles, its perfect! I love this storage bin! I would totally use it in my son's nursery. With a 3 year old and one on the way, my storage bins are all about toys! I use storage bins all over the house to contain the many toys my toddler has acquired. His room is decorated with gray and yellow chevron, so Jane's bins would go PERFECTLY! I would love to use one of these in the car for my girls' things! My favorite use for storage bins is the little stuff that takes over the world if it's not contained! I love using bins for storage in my bathroom. These would be perfect for corralling projects in my craft room! I would use these to jumpstart the much needed organization in my house. Love this! I could use this in so many ways! I would use it as a small laundry carrier! I use bins everywhere - cupboards in the bathroom, kitchen, linen closet, etc. What would I do without them?! Those are adorable! Perfect for the kids' toys! Beautiful.....fun giveaways.....I could use this so much!!!!! I love using storage bins for our messy blankets in the family room. An easy and nice looking way to keep them cleaned up when we aren't using them. My favorite use would be for extra sewing fabric or kids' toys! I use bins to keep my daughter's stuffed animals under control! I would love these to help corral the kids' toys!! IT is a great way to keep the yarn stash under control and then also have one at the front door to help pick up items that are not where they belong and put them in the tote and then carry them to where they belong. I would usemthis for toys! I love them for storing kids underwear and socks. I would get the stuffed animals put away or the balls...it's out of control sometimes! I use bins to store blankets and extra pillows in my room! These are awesome! I'd use them for our laundry. Much cuter than the current plastic basket I have! I use storage bins to organize every single closet in my home! I really love the chevron pattern and that it's so popular. I need to find a way to incorporate it in my house! I use storage bins for pretty much everything, but my favorite uses have been for kids toys and laundry hamper. I like to store my daughters' artwork. I love them in our bathroom closet to corral medicine, hair stuff, make-up, etc. right now i keep extra blankets in storage bins. I love these bins! The colors and chevron patterns are great! Fabric! I love to have them for all of my fabric to fit conveniently in. These would be great for keeping kids from getting out of control. TOYS!!!! Never enough ways to hold them all! I use storage bins for everything! i like having one by the front door for keys, wallets, sunglasses, and i love using one for my knitting supplies. My favorite way to use storage bins is to organize my craft items. Specifically by jewelry making obsession. I have seen cute stuff from this co. all over pinterest and am dying to get something! I am in desperate need of a bin to store yarn! This would be perfect! I use them to store smaller projects in progress, so I can keep all the pieces together! I'm trying to make my own craft area, I think this would be perfect! So cute! I would love a chevron storage bin for blankets near the couch! We just moved and I am in need of bins everywhere! The laundry room, the play room, the bathroom, the sewing room! As you can tell I have too many rooms! Thanksk for the fun giveaways! My fav use of storage bins is for grouping like items together and keeping everything organized! Love them! Chevron for sure! 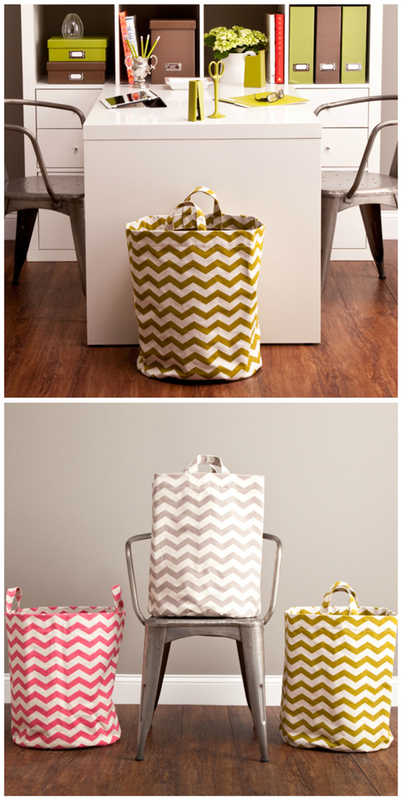 I would use the chevron storage bin to hold toys in the playroom/kids rooms. These would be perfect to corral the blankets and sweatshirts that are taking over my living room! I use storage bins for EVERYTHING!!! My favorite use for storage bins is in our playroom! I love storage bins for toys, books, and misc items around the house. I use them to corral stuffed animals and other large toys in the kids' room. Oh my!! These are beautiful!!!!! Ahhh CHEVRON!!! My pattern true love! My favorite use of storage bins if to hide my kids toys! I love to store toys or blankets in cute bins like these! Very pretty!!! Love chevron patterns. Thank you so much for the giveaway! Those totes are so cute, I can already think of a thousand places to use one around the house! So gorgeous, would be great for all my crafting stuff, to all the balls of wool and fabric, really lovely! Those are really neat. Would love to put one in my daughter's room for stuffed animals! Oooh, these bins are sooo cute! There are so many good uses for storage bins, but my most common is probably for the zillion magazines that I have waiting on deck to read. Great give-away! I use similar storage bins as pretty laundry hampers and love them! Would love one to store my baby's toys in! These look great! I would definitely use these for storage in my office! I love using storage bins everywhere. These are awesome and would look great in my loft. I love these storage bins! I would store the heck out of things with them. I can't get enough storage. I particularly like the green chevron. Love. That is all I can say! The living room. I leave cute baskets and bins around so they just look like they're part of the decor, but I can throw all of my daughter's books, toys and junk in! Makes for quick cleanup when company comes too. Wow how cute are those?! My two favourite ways to use a storage bins? 1. A hamper, especially cute looking ones, because when you live in a small space, you need something cute and functional. 2. Sweets container. I have one in my room and it contains all my chocolate goodness, chips and other snacks. I'm obsessed with See Jane Work! I use storage bins for everything - baking tools in the kitchen, extra cords and chargers in the living room, and girly things in the bathroom. I love them for stuffed animal storage! I so need these for the baseballs, basketballs, footballs, and soccer balls rolling around our playroom. Love to win this. Despite really despising these rafflecopter giveaway method. These are gorgeous and would be a great help in any room of my house! Oh, I have just the perfect spot for this! I love those bins. So cute and portable! I love that bin! It would be so pretty in my living room to hold throws! Storage for toys - you can't tell there are any toys around! Love it. I ADORE See Jane Work!! Gorgeous! 1 bag for knitting supplies and one for toys! I love bins for closet organizing and toy organizing. These are adorable! These would be great in any closet of mine, or for storing throws in the living room. I love See Jane Work products! These would be great to keep my crafts in order. We use them as my husband's dresser. Thanks for the giveaway! They are great to store blankets, magazines, pet toys/supplies, and for those that have children they are great for their rooms! I love storage bins for my son's toys and books, but also for extra pillows and blankets. I use them for everything but mostly toys! Love See Jane Work and would love to win. So many great uses for these bins, I'd use them as a paper/trash bin! Thank you! We use bins for toys, lots and lots of baby toys! I love it for toys or blankets. Looks like I'm not the only one who would love to use these bins for toys! I have been drooling over these! I would use it in the living room to hold the various toys that need to make their way back upstairs. I think these would look fabulous on my stairs to collect all my kids things that need to go upstairs! Seriously awseome storage :) I would put them to work in my sewing studio. Thanks! I would love to use these bins in my closet for sheets and such or in the family room for blankets! I love bins for my girls' toys, pjs, tutus, socks, everything I can! Love these! I would love to use these bins for my dogs toys! They could hide them well! Favorite use? How can I choose?! I use them for ev. Ery. Thing. I'm pretty sure this would become our stuffed animal storage. I use mine to store my daughter's toys and my yarn! I would use this for dirty clothes in my bedroom. Love that chevron! I could totally use one of those totes! I use storage bins everywhere all the time. It can be the laundry room, to the christmas cards, to our closet. :) These are adorable storage bags! I use storage bins to wrangle all of the craft projects I have lying around. I would love to win one! I love the chevron storage bins and would use it for gift wrapping storage in my gift wrapping area (inspired to be redone by your previous post). Thanks for the opportunity and for the fun giveaway day! Those are gorgeous! I'd love one to decorate my closet! 2 girls= need for storage bins! Awesome bag. Love the chevron. It would be a great way to hide my sewing projects in the living area. I love using a variety of storage bins to corral all my stuff. Living in a small house makes organizing critical. My favorite use of storage bins is to hide my husband's piles of random stuff! What *don't* we need storage bins for? Our house is a clutter trap. And now I need another storage bin for the new puppy's toys. Love those bins! You can never have enough storage containers. Right now I'm loving some cheap-o plastic ones for cleaning products. These are so cute! It would make a great kids' hamper or storage for toys. I love using storage bins to hide toys and stuffed animals. love to use storage bins for TOYS! we have way to many! I love using storage bins for the kid's toys. One for all my son's cars and trucks. One for all my daughter's dolls, babies, and stuffed animals. I love storage bins for toys! I love these and they would be perfect for corralling the new toys my daughter will be getting for Christmas! I use storage bins for all of those random toys. Right now, my storage needs are mostly for toys--and those bins would be perfect! They are functional, yet stylish enough to leave out. I love me a chevron! I like using them at the foot of my stairs to throw things in. When it's full, I make the trip and put things where they need to be. Toys and craft supplies! Putting things in functional and cute bins makes me so very happy! Oh, like most, I would use these beauties to corral toys! They're beautiful! My favorite use of storage bins is for sheets and blankets in our hall closet. We took the doors off to open up the hallway and make it look more like built in storage. But we still need some hidden storage! So cute storage bins on the floor hide the extra sheets and look nice. These bins look fantastic! Thanks for the chance to win! With Four young children in our home, these darling totes would not go unused!! It seems like I never have enough storage for all the toys underfoot. I would love to have a couple of them in our newly painted family room that is yet to decorated!! What mom couldn't use some cute storage bins? Love these! Cute!!! I would love one! I would use this for stuffed animals and other light-weight toys. LOVE!!!! Great for a hamper, or to corral toys! Love the pattern! toys, toys, toys! They are great for hiding the mess of toys! Everyone needs to store something! I could use some for blankets and cat toys. SO CUTE! I'd use them for kid's toys and knitting supplies. Love the chevrons! Toys! Love dumping my daughters toys in them! And they are soooooooooo pretty! These would look so cute in my spare bedroom! These would be perfect to use as an extra hamper in the bedroom or to hold the spare pillows! love them! I love storage bags for EVERYTHING! Specifically holiday items. I use bins to corral toys!! Maybe for towels in the bathroom! My favorite use? A quick way to hide a mess before company comes over. Just shove it all in! These are great! So many uses! I would use these for toy organization in our living room--so so cute! My favorite use to to keep my husband's work stuff from overtaking the house. Holy Cow!! I LOVE these bins. I can think of about 100 different places to use them. Love love love them! If I don't win, I may have to buy! These are super cute! And will work well in the laundry room. Great looking bins with so many uses! Very cool. Wow, those are beautiful! I could definitely use a storage bin in my house. LOVE this. Crossing my fingers! I can think of endless ways to use these adorable bags in my classroom and my home! The things I could do with those bins...what a perfect catch all! These I would use to store my blankets in the living room. How pretty! What wouldn't I love to store in these?! They are AMAZING! I would use them for toys or as hampers in my girls rooms. with limited closet space these bins would be a fabulous way to hide the piles that build up with no home in our apt! What fun storage! Love the pink chevron. Like so many others ... TOYS!!! First off, I LOVE YOUR BLOG! I check it out every day and you inspire me more. I am an organized freak and I always have something on my mind that I can do different to help organize our house better. I would use these bins in our playroom where there are so many toys to hide. They are super cute!!! at this stage in life...kid toys! :) I love this! Oh my gosh, we use storage bins for absolutely everything around here. Everything. Even our Chihuahuas have a low storage bin for their toys that they jump into, pull out a toy from, and play; unfortunately they have not learned to put their toys back into their bin. For soft storage bins, my favorite use is cramming them full of my daughter's stuffed animals. So many and she's only 18 months! I love to use storage bins for everything! But mainly toys! I have been needing storage items for toys!! Thanks for the chance to win! I would love to use those for so many things, from a laundry bin to wrapping paper bin, to toys! I adore the pink, but I think the grey would have the most versatility.